As many areas of the country settle into warmer temperatures, especially in the desert regions, snakes are slith ering out of their dens and becoming increasingly more active. Once temperatures begin to hit 75 degrees, snake season begins. But that’s not all… it’s also time for the inevitable emergence of spiders and scorpions, too! Yikes! But that doesn’t mean we should avoid the great outdoors and stay home. It just means to take common sense precautions and be aware of your surroundings. One of the best ways to avoid being bitten by a snake is to think about where you put your hands and feet. Look carefully before moving rocks or any object that may be providing shade for a snake. Use caution when walking through fields with tall grass, or along rivers or creeks. Keep in mind snakes are more active in the cooler hours of the day, which means they are more active at night through early morning, so consider installing outdoor lighting fixtures along porches and sidewalks, and carry a flashlight after dark. If you have a backyard swimming pool with a messy log pile next to it and dog food lying out, then you've created the perfect environment to invite rodents, which invites snakes. Some regions that received more rain than usual this year during the cooler months means there is plenty of spring vegetation to feed the rodents and birds that rattlesnakes love to eat. When the ecosystem flourishes, the animal flourishes, and a number of those birds and rodents are prey to venomous snakes such as rattlesnakes. But that doesn't mean more rattlesnakes now, experts say. That may happen in a couple years, but not until rattlesnakes get fat and happy from plentiful food and make more baby rattlesnakes. As the weather gets warmer, we see snakes come out to sun themselves and look for food, but that doesn’t necessarily mean there are MORE snakes than previous years, spring just means all snakes become more active and are therefore seen more often. Nearly all rattlesnake bites result from human error, not rattlesnake aggression. It’s no surprise that the stereotypical bite happens to a male ages 17 to 27 with large amounts of alcohol involved! All rattlesnakes can be aggressive at certain times, but not all rattlesnakes are aggressive in general. Some don’t possess their iconic “rattle” but it’s best to assume all snakes are venomous. Although new species of rattlesnakes continue to be discovered, there are currently about 20 species in the United States (13 of those are found in Arizona). The most commonly encountered is the western diamondback; it accounts for the most bites and deaths. They are not aggressive; they're defensive. If you see any type of rattlesnake, don't make it feel threatened and leave a lot of room between you and the snake. • Remain calm and move beyond the snake's striking distance. • Remove jewelry and tight clothing before you start to swell. • Position yourself, if possible, so that the bite is at or below the level of your heart. • Clean the wound, but don't flush it with water. Cover it with a clean, dry dressing. • Don't use a tourniquet or apply ice. • Don't cut the wound or attempt to remove the venom. • Don't drink caffeine or alcohol, which could speed your body's absorption of venom. • Don't try to capture the snake. Try to remember its color and shape so that you can describe it, which will help in your treatment. Of course your best defense against venomous snakes is not to take a chance in the first place. Adults can wear snake bite protection such as lower leg snake gaiters or full chaps or snake proof boots when working or playing in snake country. Snake chaps for children also available. Be safe and have fun! Rattlesnakes usually stay away from humans, but health officials say about 8,000 people are bitten by venomous snakes in the country every year. Snakes bites are most prevalent between April and October and are on a record pace this year, according to many poison control centers. It doesn’t seem to matter if you are on the East Coast or the West Coast, or down South— location doesn’t matter. Snakes are very temperature-dependent, so it’s more a matter of warm weather than a particular state or region. The number of calls last month to the Carolinas Poison Center about snake bites nearly quadrupled compared to last year. More than 500 calls about snake bites are expected in California. Georgia Poison Control reports a 50 percent increase in the number of bites reported this year compared to the same time period last year. This is a small sampling, but represents what most states are experiening in late summer. Be alert. Like all reptiles, snakes are sensitive to the ambient temperature and will adjust their behavior accordingly. After a cold or cool night, they will attempt to raise their body temperature by basking in the sun midmorning. To prevent overheating during hot day, they will become more active at dawn, dusk or night. Wear sturdy boots or gaiters. Kid size snake chaps are worth considering, too. Never go barefoot or wear sandals when walking through brushy, wild areas. Startled snakes may not rattle before striking defensively. Children should not wear flip-flops while playing outdoors in snake country. When hiking, stick to well-used trails. Avoid tall grass, weeds and heavy underbrush where snakes may hide during the day. Never hike alone. Always have someone with you who can assist in an emergency. Do not step or put your hands where you cannot see. Step on logs and rocks, never over them, and be especially careful when climbing rocks or gathering firewood. Check out stumps or logs before sitting down, and shake out sleeping bags before use. Be careful when trimming tall weeds or working around wood piles even in your own backyard. Never grab “sticks” or “branches” while swimming in lakes and rivers. Rattlesnakes can swim! It’s not known why they take to the water, other than sometimes to escape predators. Leash your dog when hiking in snake country so they can’t poke their noses into holes where a rattler might be hiding. If you do get bitten, don’t try using an ice compress or a tourniquet. Don’t try “cutting and sucking.” Seek immediate medical attention and take comfort in the fact that the bites may cause intense, burning pain but are rarely fatal, unless it is a child or pet, in which case a bite can be deadly. Once at a hospital, treatment depends on the type of snake involved, the amount of venom injected and the health of the person bitten. If your dog is bitten, take it to the veterinarian immediately to receive the antivenin treatment. Although snakes of any kind are not "out to get you," bites can and do occur. Your best defense is don't take a chance! Wear snake gaiters or snake pants when in known snake country - whether that be the desert or woods - and greatly reduce your chances of being bitten! As the weather heats up, rattlesnakes especially become more active. They, like humans, tend to explore when the weather gets warm. Also like humans (those who enjoy the great outdoors, that is), rattlesnakes tend to avoid developed areas, preferring undisturbed, natural habitats. That means the more you hike, hunt, camp, fish, bike and recreate in wilderness areas, the greater your chances of encountering a pit viper. And another thing they have in common with humans is they tend to be found in log piles and rocks and other natural "seats" where you might be likely to enjoy your lunch or bask in the sun. They also can be found in swampy areas. Snakes are able to regulate their body temperature by moving in and out of shade. A warmer body allows a snake to move faster when trying to catch prey (insects, slugs, frogs, birds, bird eggs, small mammals, and other reptiles). Rattlesnakes are native to North America, living in diverse habitats. There are 36 known species of rattlesnakes, with between 65 and 70 subspecies. 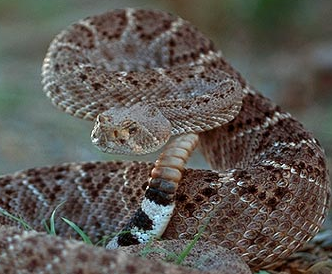 The state with the most types of rattlesnakes are Texas and Arizona. Even baby rattlesnakes possess dangerous venom as soon as they hatch. Rattlesnakes all have the ability to rattle, hence their name, but they don't always make a rattling sound, so someone can be standing next to one and not even know it. Northern Pacific Rattlesnake: The color pattern is usually dark-brown, dark-gray, olive-brown, or sometimes black or pale yellowish ground color overlaid dorsally with a series of large, dark blotches with uneven white edges. These blotches are also wider than the spaces that separate them. Additionally, a lateral series of blotches, usually darker than the dorsal blotches, is clearly visible on all but the darkest specimens. The first rings of the tail are about the same color as the last body blotches, but these rings become progressively darker; the last two rings, at the base of the tail, are usually black. The belly is pale yellow, usually with brown spots. A large, dark-brown blotch on the snout has a pale border behind it. There is a dark brown postocular stripe with a white border that extends from the eye to around the angle of the jaw. Western Diamond-Backed Rattlesnake: A large and heavy-bodied species, this rattlesnake's coloring varies from chalky gray to dull red, appearing dusty due to minute flecks and dots on the scales. As suggested by its common name, this species has diamond-shaped markings over most of its body, which are edged with black and white. These markings are replaced by conspicuous black and white bands towards the rear of the tail, just in front of the rattle, while the head has two characteristic pale stripes, one in front of the eye and the other behind, which run diagonally down the head towards the mouth. Timber Rattlesnake: This is the only rattlesnake species in most of the populous northeastern United States; it is the third largest venomous snake in the United States.The physical color of a timber rattlesnake can vary widely depending on its area. Some are gray with a rich black pattern, some are tan with a sulfur yellow pattern, and some are a combination of both. They have V or W-shaped crossbar markings, which create a distinct pattern across its back. Generally they have a wide head and narrow necks. 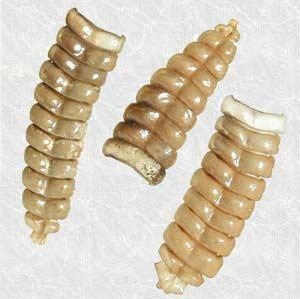 They have a distinctive rattler on its tail made up of a special scales. Their eyes are yellow, with elliptical pupils. These are large snakes, generally ranging from 36-60 inches (90-152 cm) in length and between 1.5 to 3 pounds. It is estimated that 7,000 to 8,000 people are bitten by venomous snakes in the United States each year, resulting in many deaths. The most important factor in survival is the time elapsed between the bite and treatment. Most deaths occur between six and 48 hours after the bite. If antivenom treatment is given within two hours of the bite, the probability of recovery is greater than 99 percent. Still, any bite by a rattlesnake must be considered a life-threatening medical emergency! When a bite occurs, the amount of venom injected is under voluntary control by the snake. The amount released depends on a variety of factors, including the condition of the snake (e.g. having long, healthy fangs and a full venom sack) and its temperament (an angry, hungry snake that has just been stepped on vs. a satiated snake that was merely surprised by walking near it). About 20% of bites result in no envenomation at all. Common symptoms include swelling, severe pain, tingling, weakness, anxiety, nausea and vomiting, hemorrhaging, perspiration, and eventually heart failure. Local pain is often intense, and will increase. Children generally experience more severe symptoms because they receive a larger amount of venom per unit of body mass. If bitten by a rattlesnake, stay calm and send someone to call 911. Always hike with a friend so you can help each other in case of emergency. The victim should remain calm by lying down with the affected limb lower than the heart. Do not waste precious time on tourniquets, "cutting and sucking," or snake bite kits. If you are by yourself, walk calmly to the nearest source of help: another person or a phone to Dial 911. Do Not Run. If you are not sure what kind of snake bit you, check the bite for two puncture marks (in rare cases one puncture mark) associated with intense, burning pain. This is typical of a rattle snake bite. Although snakes of any kind are not "out to get you," bites can and do occur. Your best defense is don't take a chance! Wear snake gaiters or snake boots when in known snake country - whether that be the desert or woods - and greatly reduce your chances of being bitten! Headlines like these, while scary, serve a good purpose— to remind us to be alert and prepared while we’re in snake country. Worldwide, there are over 100,000 confirmed deaths from snakebites every year; the vast majority of those deaths do not occur in the United States. But when people here do get bitten, whether it’s by a rattler, cottonmouth, copperhead, coral snake, or other viper, it’s usually between the months of April and October. Just about a quarter of all rattlesnake bites are “dry,” where no venom is injected. Other bites that do inject poisonous venom will definitely ruin your day, but not always kill you. The effects of being bitten are unpleasant to say the least. According to bite victims, your face starts tingling, your flesh feels like someone has sewn hot coals beneath your skin, your pulse flutters, and your limb puffs up like a water balloon. Not to mention the cost of being treated with anti-venom. Why even take that chance? Overall, rattlesnakes are an important part of the ecosystem as they eat rodents and are eaten by other predators. They are generally shy creatures and will gladly retreat if given enough room, but their bites can be extremely dangerous, so knowing what to do to avoid them in the first place is key. The sound of rattling can instill cold fear in a hiker, but that's a good thing. You got the warning before accidentally stepping on or too close to a snake! Never go barefoot or wear sandals when walking through wild areas. Wear over-the-ankle hiking boots with snake gaiters, or wear snake proof boots. For full leg protection, consider snake chaps. Do not step or put your hands where you cannot see and avoid wandering around in the dark. Step on logs and rocks, never over them, and be especially careful when climbing on rocks or gathering firewood. Check out stumps or logs before sitting down, and shake out sleeping bags before use. Teach children to respect snakes and to leave them alone. Children are naturally curious and will pick up snakes. Seek IMMEDIATE professional medical attention if bitten. 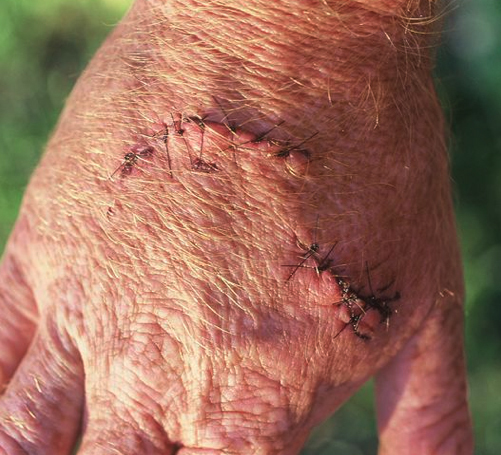 Most posts on this blog are about protecting yourself from snake bite while outdoors— while hunting, hiking, clearing brush, or just walking your dog while in the desert or woods where snakes live. But what if you found a rattlesnake in your bathroom at home?! Unfortunat ely, a family in Texas was recently taken by surprise when they discovered a live rattlesnake slithering in their toilet bowl! 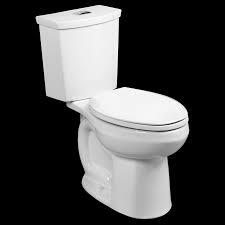 According to the family, the snake was pretty much alive and was doing its best to climb out of the toilet bowl. The family called in a snake removal company. Lucky they did that, not only for their own immediate safety, but because upon inspecting their house, the snake removal company found more than one stray snake. Unbeknownst to anyone, their cellar had become a rattlesnake den! According to the company’s spokesperson, the snake removal team found more than 20 rattlesnakes in the family’s storm cellar. And, five of those snakes were infants. Rattlesnakes are extremely protective of their infants, but fortunately no injuries were reported by the family, and the large rattlesnake population was successfully relocated. As for the little creeper that exited through the family’s toilet, the experts believe that the snake somehow managed to enter a relief pipe and to make its way up. To ensure the family’s safety, the snake removal company sealed the relief pipe. 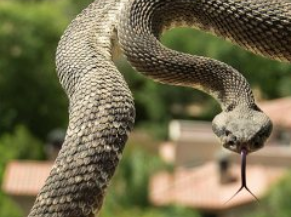 After a clean sweep, no other rattlesnakes were found on the Texas family’s property. Although the family claimed that they hadn’t seen a rattlesnake on their property for years, the company’s spokesperson declared that even though we can’t see them, snakes are still out there. Rattlesnakes and other poisonous vipers can be masters of disguise— relying on skin camouflage in order to elude bigger predators. That's how snakes can take up residence in your residence— if you don't hear a rattle, you don't necessarily know that they are there. Or they might be living in an area of your home or yard where you don't visit very often, such as a basement or outbuilding. In addition to checking the rarely used areas of your home and property, your best defense against unwanted visitors is to make your property unattractive to snakes. Don't give them places to hide (abandoned junk piles and overgrown brush) and eliminate their food source such as mice and other small rodents. The neurotoxin carried by the snake’s venom can kill an adult in six hours or less. Even if not fatal, rattlesnake bite symptoms may include pain, tingling, swelling, numbness, nausea, weakness, and breathing issues— so don't take a chance! Whenever you are in snake country, protect yourself by wearing snake gaiters or snake boots and keep your eyes open to stay safe! Yikes! A bite a day in just southern Arizona alone?! The Grand Canyon state is home to 13 species of rattlesnakes, with eight or nine species living in Southeastern Arizona, depending on how the region is defined, and on average, 150 to 160 rattlesnake bites are reported every year. Multiply those statistics by all the states where poisonous vipers live, and you know why you've got to be careful this summer! Rattlesnakes typically come out of their winter dens in March or April, and return in November. They range far and wide — from deserts, canyons and forests to urban backyards. Some rattlers slither a mile or more from their dens to places where they spend the summer— many times in the same places where humans and dogs hike, camp, hunt and live. Some rattlesnake bites are so-called “dry bites” in which no venom is injected. Sometimes the dry-bite rate can be 20 percent. It all depends on the age of the snake, if it has recently eaten (and used its venom on the rodent it bit), and other factors. 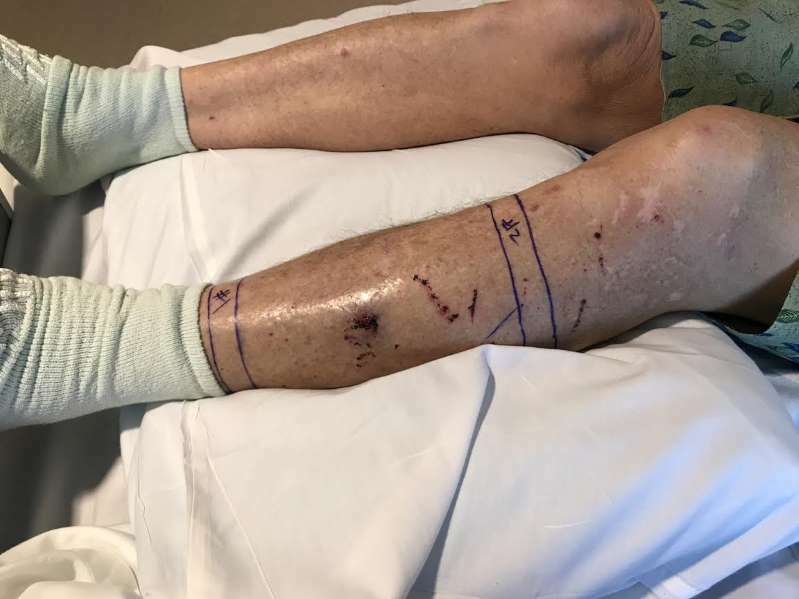 Rangers in Boulder County are warning hikers and cyclists to be on the lookout for snakes in the grass after a Wyoming resident who'd been visiting friends in Colorado was bitten on the shin by an adult snake that was about three feet long. The friends reportedly got off their bicycles and were crossing an open grassy area to go to a different trail when the woman was bitten. The victim was airlifted to a nearby hospital, treated with anti-venom, and was released. "Contrary to many people's understanding, rattlesnakes do not deliberately harm people. They will only strike if threatened; otherwise, rattlesnakes will do everything possible to avoid a human encounter." Officials in Boulder caution people to watch where they step, particularly when in rocky or grassy open areas, and to be careful about what you wear. Especially this time of year the weather is beautiful and you want to wear shorts, but leaving one's legs bare and ankles exposed may not be wise for people who leave the traveled trails. Always keep your dogs on a short leash when hiking to minimize the opportunity for them to poke their nose where a prairie rattlesnake might be hiding. Snake bite victims are generally not doing anything wrong. They are just in the wrong place at the wrong time— working in the yard or around a wood pile, or outside enjoying the summer— and nothing could have been done to prevent the bite. But if you are purposely going into known snake country to hike or hunt, the best prevention is to wear snake gaiters or snake proof boots. If the worse happens, the best response to a bite is to go immediately to a medical facility for examination and treatment with anti-venom if needed. No cutting, no sucking, no tourniquets. Just get to a hospital. Other tips include not putting ice on the bite, and any limbs that are bit, whether it be on the arm or the leg, should be kept below the heart. 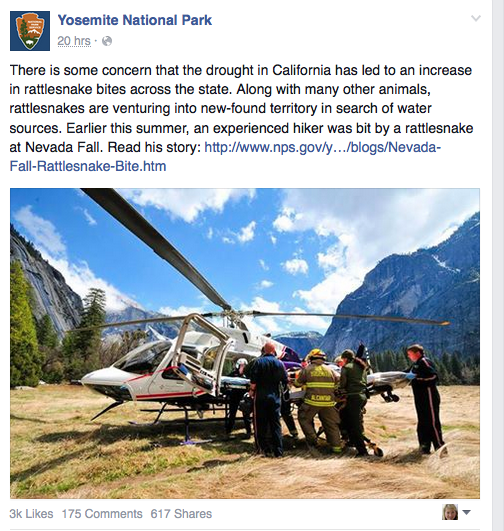 On June 29, 2015, sometime around 4 pm, a 49-year-old day hiker at the top of Nevada Fall experienced what many people would consider their worst nightmare: being bitten, and envenomated, by a rattlesnake. He was an experienced hiker and had come across rattlesnakes in the wild before. The top of Nevada Fall was the objective for the subject and his family. Upon reaching the footbridge at the top of the fall, they decided to do what many hikers feel the need to do after walking in the afternoon heat: take off their shoes and cool their feet at a safe spot in the river. As the subject made his way back onto the granite shoreline, he stepped down into a shallow recess between several rocks and was immediately bitten on the right foot. Moments later, another member of the subject’s family dialed 911 and reported the incident, at which time Yosemite Search and Rescue began to mobilize their response. A rescue team began hiking to the patient's location as park helicopter 551 mobilized. Approximately one hour after being bitten, 551 airlifted the subject from the top of Nevada Fall and flown to the valley floor, where medical care was waiting. The clinic staff administered antivenom medication to the subject, stabilized him, and readied him for transport to a regional hospital via a medical helicopter. Many people see rattlesnakes while hiking in Yosemite. Snake bites are rare here, but it is important to know that they do occur and that the resulting injuries can be serious: this subject spent several days in the hospital recovering from his bite. It is understandable that the patient was barefoot while wading, but for the rest of the hike, a pair of snake boots or other sturdy shoes can protect against many snakebites. Snake gaiters offer snake bite protection from approximately your knee down to your ankle and should be worn with sturdy boots. An important lesson to learn from this incident is to always be aware of where you place your hands and feet—in addition to snakes, crevices can hide scorpions, spiders, and yellow jacket nests. This hiker didn't do anything wrong. In this case it just happened to be that a viper proved to be the most dangerous part of the trip— not the obvious hazards of the quickly flowing river, the granite cliffs, or the midday heat. If you are bitten, keep in mind that the most effective treatment for snakebite is to seek medical care at a hospital or emergency room as quickly as possible. Gone are the days when snakebite first aid involved cutting into the bite and sucking the venom out of the body. Don't try it! It doesn't work! Finally, treat all wildlife with respect and give them the space they need to stay wild. Never approach wildlife to feed, pet, or photograph them. No matter how docile the animal or reptile may appear, it is wild and could spook easily. 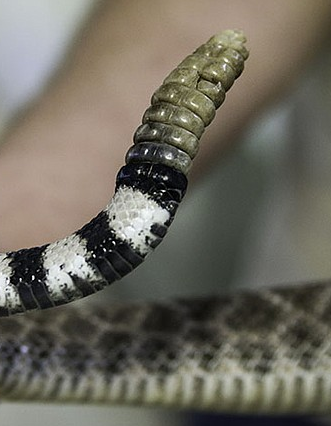 No one knows for sure how many people are actually treated for venomous snakebite annually, but according to a Parks and Wildlife Department herpetologist, each state usually reports of one or two deaths per year. For those bitten who survive, treatment for rattlesnake bites reportedly runs anywhere from about $20,000 at the minimum up into the six-figure range. Anti-venom and treatment is very expensive! Young children out exploring and intoxicated young men make up a good chunk of the bite victims. Hikers and hunters also get bitten, as do those who work in and around snake habitat, especially when moving logs and rock piles. To keep you and your family safe, it’s important to be aware of your surroundings and to know which venomous snakes you might encounter where you live, work, and play. Texas has the most snake bites annually in the country, usually between 500 and 1,000. One-third to a half of those bites are venomous. Experts in the Lone Star State say you only need to worry about four species: western diamondback rattlesnake, copperhead, coral snake, and cottonmouth (also called water moccasin). Size does not matter because they are venomous at birth. Coral snakes spend most of their time under leaves and logs and few people ever see them. They really aren’t a threat unless they are handled. Cottonmouths have black and white chins, float on top of the water and are not all that common. The copperhead is the only snake in Texas that is a two-color banded snake. The majority of venomous snakes sighted in residential yards are the diamondback. This rattlesnake sheds within 10 days of being born and then scatters. Babies end up in some strange places, like back steps and garages, looking for mice and lizards to eat, so you’re most likely to see this snake around homes and sheds. Adult diamondbacks want to stay away from activities and people. The most common snakes people encounter that are not poisonous are rat snakes—the only large snake that climbs. Get away from the snake but stay as immobile as possible until help has arrived. Remove clothing or accessories that may restrict your blood flow and cause swelling. Don’t try to capture the snake – this is unnecessary and can lead to a more dangerous situation. Don’t create an incision or suction the wound. Don’t administer any drugs to the victim. Don’t apply a tourniquet (restrictive device used to constrict the flow of blood to a body part). Don’t apply ice to the snakebite. Don’t wait to see if symptoms occur – seek professional medical help immediately! It's rattlesnake season again! Most people fear those words, but a few actually relish this time of year. Are they crazy? Well, not exactly. Some folks have a job that involves tracking and catching snakes for research or preservation. Take, for example, Ann Stengel in Sheffield, Massachusetts. Ms Stengel is a UMass Amherst doctoral candidate out to save the timber rattlesnake in New England. It turns out that the rattlesnake populations are endangered in that region. The largest population left in Massachusetts—and possibly in New England—is found in Berkshire County. Human incursion into habitat and malicious killing of the snakes have greatly disturbed their numbers. And given that female snakes only reproduce once every three to five years and 80 percent of offspring can be expected to die in the first year, the snakes are slow to rebuild depleted populations. In the name of science, people like Stengel take newborn snakes into captivity for a year or a year and a half, then release them near their den site with the hope that they adapt back into the wild. Some do and some don't. The more successful this project becomes, the more people who find rattlers fearsome will object to it. In response, Ms. Stengle points out that snakes are good for rodent control, and that to date no one in Massachusetts has ever died of a rattlesnake bite. In fact, bites are extremely rare as timber rattlesnakes, the species found in the Berkshires, are not very aggressive. A bride-to-be in El Dorado County, California wishes the rattlers in her area were not aggressive. Instead of marching down the aisle to say "I Do" Macee Whitton found herself in the hospital on her wedding day. A week before her Big Day, she was outside with her dogs and a rattlesnake bit her on the ankle. Despite getting bags of anti-venom at a nearby medical center, the poison kept traveling through her body. She had a lengthy hospital stay and it took weeks to recover. Her wedding has been rescheduled. 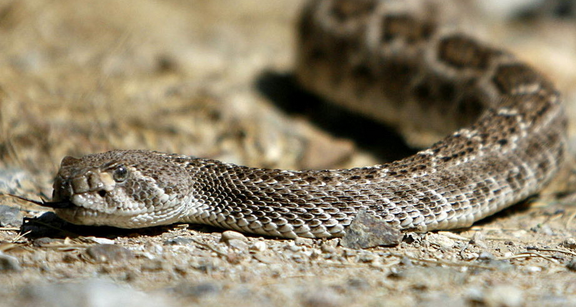 According to the California Poison Control Center, most bites occur between April and October when snakes and humans are most active outdoors. The vipers usually den from late October to early April. Their body temperature will get down to 40 degrees. They lose very little body weight because they shut down metabolically. A female rattler is pregnant for more than a year before giving birth to eight to 12 live little snakes. You might think the mother rattler then slithers off and leaves the little ones to fend for themselves, but researcher shows that the mother remains with her young until she leads them to the family den at the end of fall. There, the little ones, their mother and 30 to 50 other snakes will disappear deep into the ground below the frost level to sleep away the winter. Once the snakes emerge from hibernation at this time of year, they have a kind of social life. They often use the same basking areas, and are particularly fond of south-facing rocky slopes. During the warm months snakes will travel— males up to four miles and non-pregnant females about two miles. But they always return to the same den. An adult rattler can live for 45 years if it avoids predators such as humans and red-tailed hawks. The best thing you can do when in rattlesnake country is not to avoid the great outdoors, but to be prepared by wearing snake gaiters or snake proof boots. And don't ever let your guard down. Keep an eye out, be careful of where you sit, and don't reach into blind areas under rocks or wood piles where rattlesnake hang out. 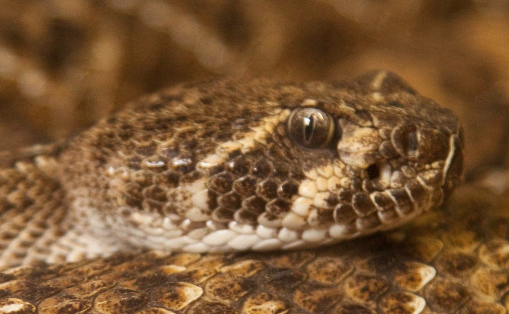 Could Rattlesnakes Lose Their Genetic Ability to Rattle? We all know that there's a specific purpose to a snake's rattle— to scare larger animals and humans away. And it generally works! Hearing that rattle signals immediate danger and most of us move away as quickly as possible. But what if you couldn't hear the rattle and be warned? What if you sat down on a log or were walking down a trail and didn't know that a snake was inches from you because there was no warning rattle?! Some experts say that's what is happening with the Crotalus Viridis¸ or the prairie rattlesnake in the Black Hills of South Dakota. 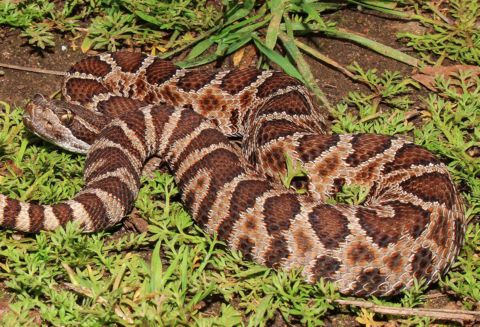 Over the past couple of years, naturalists have noticed many rattlesnakes with “curly-Q” tails, like you find on pigs. The tail muscles on these snakes have atrophied and can’t move the rattle. Snakes that have this genetic defect are the ones that are surviving. They reproduce and pass along that genetic defect to their offspring. The benefit to the snake is that if they are not heard, they are not killed. Because when most people hear that chilling rattle, if they have a garden shovel or gun available, it's all over for the snake. Most people WANT to hear the rattle. It's helpful to both snakes and humans. These reptiles don't really want to bite humans— that would be a waste of venom on something they can't eat. So rattling warns us to get away, saving both species. Two hundred years ago when Native Americans were the only people in South Dakota, a rattlesnake would rattle and they would respect it and leave it alone. When white settlers moved in, however, and heard a rattlesnake rattle, they instantly killed it. So perhaps this genetic abnormality is actually saving rattlesnakes from certain death by humans? There is no scientific data to back up this theory other than from observing that the rattlesnakes are developing this behavior, but it's worth keeping in mind for those who spend a lot of time in the desert or woods where rattlesnakes live. Keep in mind that if someone is bitten by a rattlesnake, the old wives tales about sucking out the poison, drinking alcohol, and other methods work won’t. The best thing is to carry basic First Aid supplies in your backpack, and then get help right away— get to a hospital and get anti-venom. Better yet, don't take a chance. Wear light-weight snake gaiters or snake boots and you won't have to worry about getting bitten— whether that snake is able to send a warning rattle or not.